Horatio Nelson first met Simon Taylor during the American Revolutionary War, while stationed in Jamaica. The two remained in touch. As Nelson remarks towards the end of this letter, by 1805, they had been acquainted for about three decades. The letter was written while Nelson pursued the French fleet in the Caribbean, during the months before the Battle of Trafalgar, and in it Nelson expressed his opposition to William Wilberforce and the abolitionists. (The redacted name was that of Wilberforce). This version appeared in William Cobbett’s Political Register on 21 February 1807, while parliament debated abolition. Cobbett sympathised with slaveholders like Simon Taylor, hated Wilberforce and opposed the abolition of the slave trade. 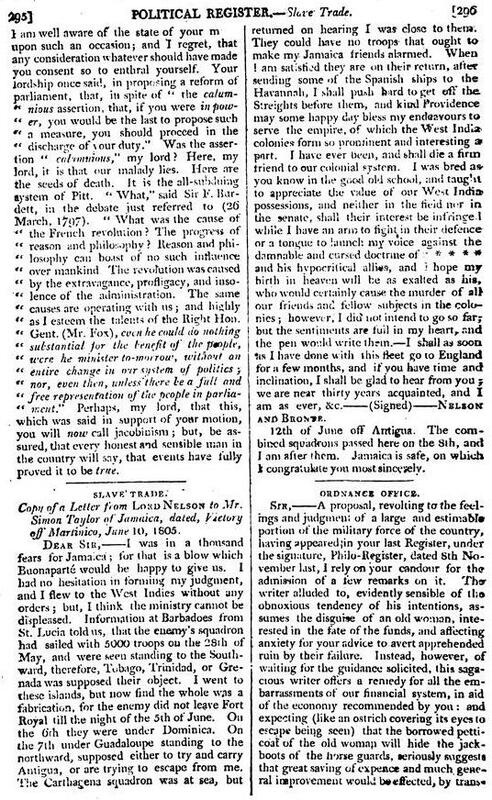 It seems likely that Taylor provided him with a copy of this letter in an effort to mobilise the heroic and patriotic reputation of the recently deceased Lord Nelson behind the pro-slavery cause, as part of a last ditch effort to halt the progress of the Abolition Bill. This entry was posted in Abolitionism, Armed forces, British Government, Defence of slavery, Navy, Revolution/War, Slave trade, Slave trade abolition, The Letters, War and tagged Caribbean, empire, History, Horatio Nelson, slavery, William Wilberforce by Christer Petley. Bookmark the permalink.